USS Midway CVB-41 as completed in September 1945 with eighteen 5"/54 (12.7 cm) guns. 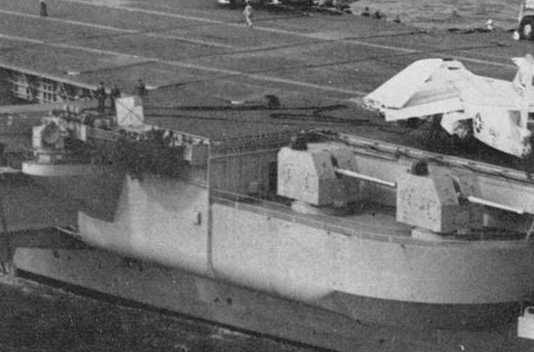 These carriers had improved flight deck operation as compared to the previous Essex (CV-9) class as all their 5" (12.7 cm) AA guns were mounted below the flight deck level. U.S. Naval Historical Center Photograph # 97631. This weapon grew out of a design study for replacing the 5"/38 (12.7 cm) Mark 12 and was originally planned for the never-built Montana Class battleships. They actually made their first service debut aboard the large aircraft carriers of the Midway class (CVB-41) and later on the gunnery training ship USS Mississippi AG-128 (ex BB-41). 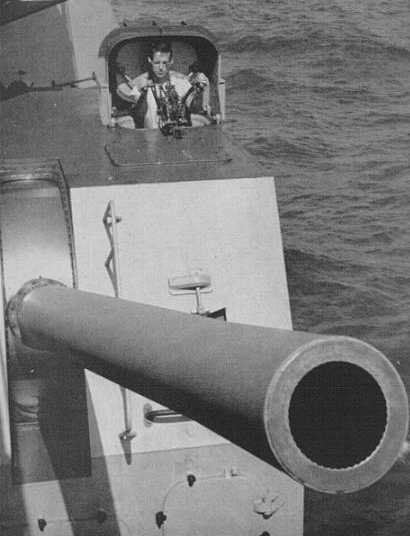 This gun was not as popular as the 5"/38 (12.7 cm) Mark 12, possibly because the larger projectile and cartridge cases resulted in faster crew fatigue. 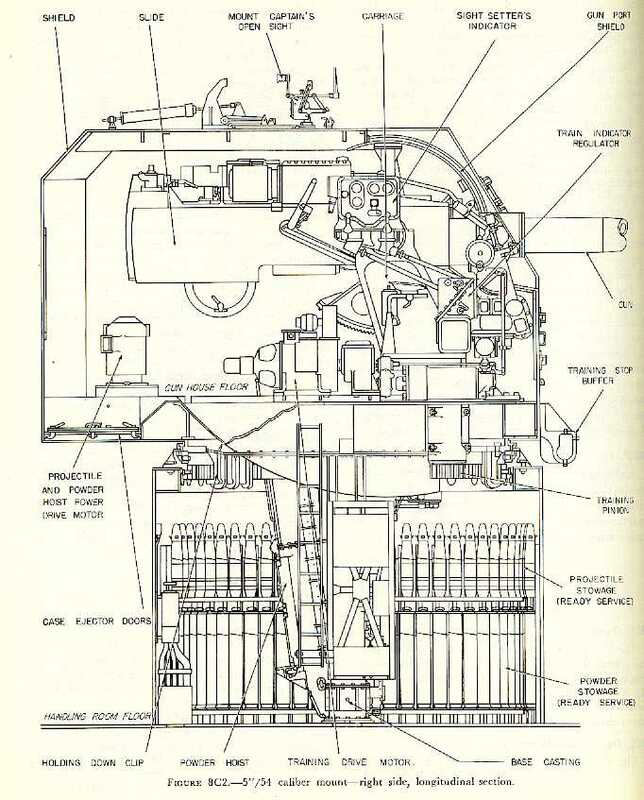 Essentially, this weapon was simply a longer version of the 5"/38 (12.7 cm) Mark 12 and should not be confused with the later 5"/54 (12.7 cm) weapons which included automatic ammunition feeding provisions. These guns were gradually removed from the Midway class carriers as weight compensation for growth in other areas. Some of these mountings were then reused on new-construction Japanese destroyers. At least two mountings still exist, one at the Military Museum of Southern New England in Danbury, Connecticut and the other at the White Sands Missile Range in New Mexico. 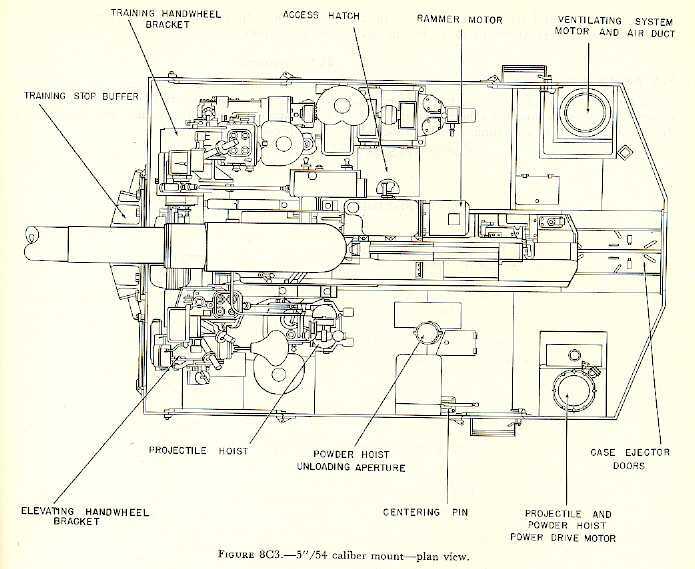 Nomenclature Note: This was the last USN 5" (12.7 cm) weapon that was best known by the gun barrel Mark number designation, although a few works refer to it per its Mark 39 mounting designation. All subsequent 5" (12.7 cm) designs are known by the mounting Mark number designation. 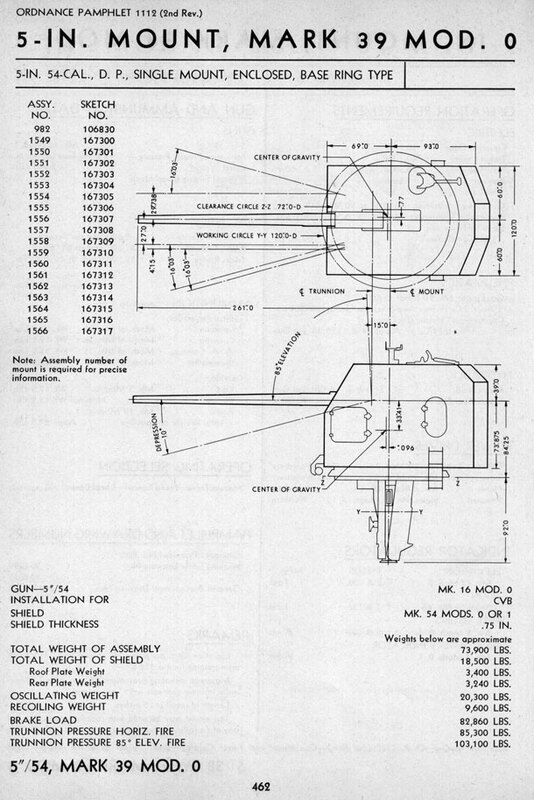 See USN Naval Gun Designations for more information. 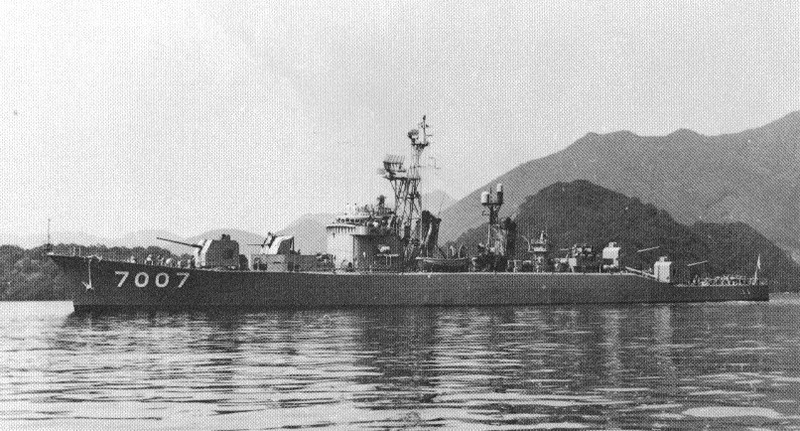 ^Akizuki and her sister Teruzuki were laid down by Mitsubishi in 1959 to a modified USS Fletcher (DD-445) design. ^The wide availability of ammunition for this and subsequent USN 5"/54 (12.7 cm) guns led the French to use these munitions for their own 127 mm (5") guns. ^2.12.22.3Mark 41 projectile bodies could be used with Point Detonating (PD), Mechanical Time (MT) or with proximity (VT) nose fuzes. When used with PD fuzes, they were considered to be HC rounds while those with MT and VT fuzes were considered as AA rounds. Rounds with MT or PD nose fuzes had an instantaneous contact type base fuze. A blind plug was used in place of the base fuze for those projectiles using VT nose fuzes. ^Special Common Mark 42 had a windscreen and a thin hood and was strengthened to enhance its armor piercing qualities. ^4.14.2The illumination round burns for approximately 50 seconds. ^Both single and twin mountings were base ring types and had projectile and powder hoists on the axis of the mount. ^These mountings used amplidyne all-electric power drives. ^A minimum crew of sixteen men were required for the single mounting, with ten in the gun room and six in the handling room. Additional crewmen were required in the lower ammunition spaces. ^USS Coral Sea (CVB-43) had only 14 single mounts when commissioned. The Midway class carriers had the number of guns reduced over the years as compensation for weight growth in other areas, with all guns removed from Midway and Coral Sea by 1980 (the third member of the class, USS Franklin D. Roosevelt (CV-42), was retired in 1977). Close up of 5"/54 (12.7 cm) on USS Coral Sea CVB-43. Note the lack of a barrel liner. Photograph courtesy of Bob Dorais. Two 5"/54 (12.7 cm) Mark 16 guns on USS Coral Sea CVB-43. Note the Mark 57 director on the sponson at the far left. 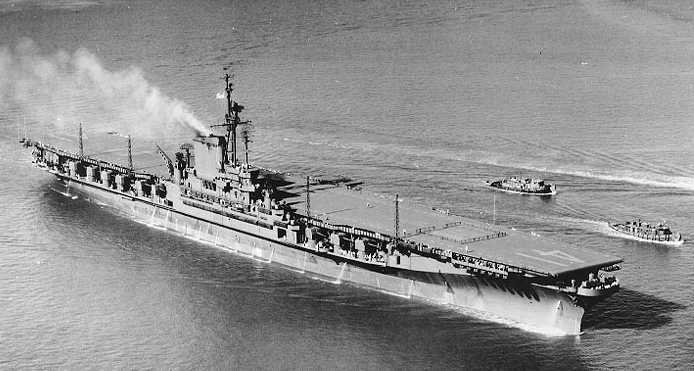 USS Coral Sea was the only Midway class carrier to use this director, the others used Mark 37 directors. Photograph courtesy of Bob Dorais. 5"/54 (12.7 cm) now at Launch Complex 35 West at the White Sands Missile Range in New Mexico. 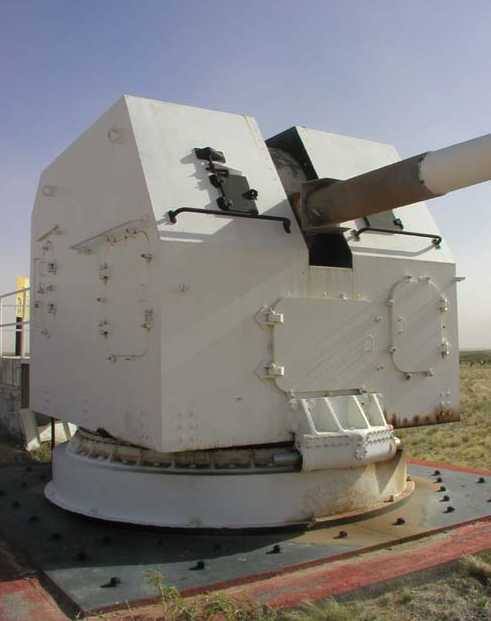 This mounting was used to fire laser guided projectiles during tests in the 1980s as shown in the next image. Photograph copyrighted by Heron Aerospace. 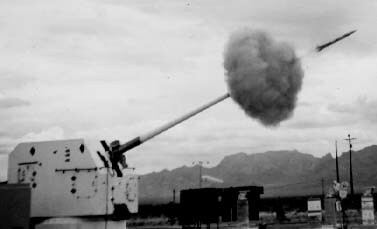 5"/54 (12.7 cm) firing a laser guided projectile during a test in 1982. U.S. Army Photograph. Japanese auxiliary vessel Yudachi ASU 7007 (ex-DD-108) in 1986. Photograph from the collection of L & L Van Ginderen Collection. Well-known painting of USS Montana BB-67 showing her ten portside 5"/54 (12.7 cm) guns. U.S. Naval Historical Center Photograph # NH 61246. Side view of 5"/54 (12.7 cm) Mark 39 Mounting. Top view of 5"/54 (12.7 cm) Mark 39 Mounting. 5"/54 (12.7 cm) single mount as used on USS Midway (CV-41) class. Sketch from OP-1112. Image courtesy of HNSA. 23 March 2012 - Added source for picture page. Added picture of Yudachi.